From time to time I take a close look at my workflow to see if I can improve it in any way. Incorporate new tools, processes, or ideas—or remove things that don’t work or cause more noise than signal. I’d like to share a productivity hack that’s worked well for me recently when trying to decide what to work on each day. Faced with a full plate of tasks, requests, emails, and interruptions—which should I tackle first? Is it urgent for today? Here’s my version of a decision tree that combines the questions and answers. I’m inspired by similar grids and charts that you might have seen. There are several variations of these “getting things done” (GTD) decision trees and quadrant matrices. 3. Stephen Covey’s “time management matrix” which uses quadrants to rank task in a two-by-two matrix based on importance and urgency. A few notes about my flowchart graphic [direct download in PNG format, 224 KB]. I use @ notation for email labels to determine both status and type of action needed: @action, @reply, and @read/review, etc. The “Soon / Later” items at the bottom right—those logged for later—do become things to start with again once they come up in review. In my workflow, I repeat the flowchart decisions for each item during weekly and monthly review. “Quick wins” aren’t mapped here; they are tasks that don’t take much time and are easy to complete. 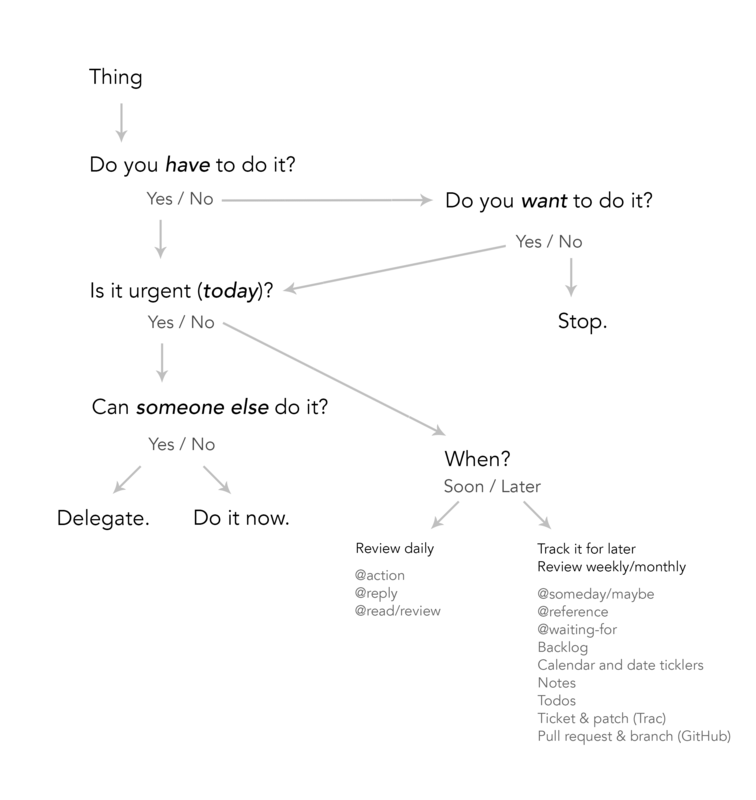 You can shortcut the flowchart from “Not urgent for today” to “Do it now” for these quick ones. Sweet! Now I can mark as done posting this to my blog.